Have you ever launched a journey without a destination in mind? You have a general sense of direction, sure, but no specific longitude or lattitude marker. Thats where I am at right now……a million little forays into the unknown have already happened. Like a maze of little paths that appear on old trees; Parallel, intertwining, straight, curvy. Some stopping short of the branch length, some going all the way. Others just going around infinite circles. But the branches always gravitate towards the sun…upward or outward… those lines follow suit. What is my sun? ……Destination unknown! Every Journey presents learning opportunities. Academic, emotional, spiritual, physical and soulfull lessons. Over time I will come back to share some of these. At this stage I am using this blog to catalogue my academic learnings as I prepare for the first stage of this journey. This is like my own little topic Wiki for the various study areas. Bear with me if you find it random as there is no specific order in which this ifnormation will appear. This is a bit of a personal indulgence. So come walk with me…..
Updating pictures on my facebook page today made me realise how much time has gone by since I have been consistently creative and making art! Wow my mojo sure took a long holiday it seems!AWOL – bad mojo! I’ve had some crazy kind of creative block. Some of my favorite excuses ‘No time’, ‘Yes time but no mood’, ‘yes mood but physically unwell’, ‘Gosh my table is messy’, ‘gosh my studio is messy’, ‘Getting inspired by Pinterest….6 hours later still getting inspired by Pinterest because facebook came by to say hello and Whats app was feeling needy or Skype was beckoning’…one word procrastination!!! Like really! why would you procrastinate on something you enjoy! Isn’t that reserved for unsavory chores and tasks! Well whatever the reasons (ahem excuses) fact is hardly any art happened! That’s not to say other creative things did not happen! Frames finally went onto walls (then took 2 months to have pictures in them), Art went onto walls, I creatively rearranged the studio (or so I like to think), cake orders happened……despite all this that ‘no art happening’ thing was really eating at me. Then the USA happened…..OMG retail theraphy is the cure for all maladies! Hobby Lobby…check! Michaels…..check! Joanns…..check…….going to these stores was truly was a pilgrimage to the holy land of creativity. Having heard about all these amazing places over the years it was mind blowing to finally stand inside those doors….gawking! at the sheer size of the store and variety of materials available. I even discovered new crafts. But most important the prices! Had a bit of a Willy Wonka golden ticket moment handing over my 40% off coupon…:)))) Christmas came super early! 3 weeks since I got back and I have been bursting with ideas and plans and layouts and enthusiasm! yes lots of enthusiasm……did I mention enthusiasm! LoL let me exit on that note before I jinx myself. 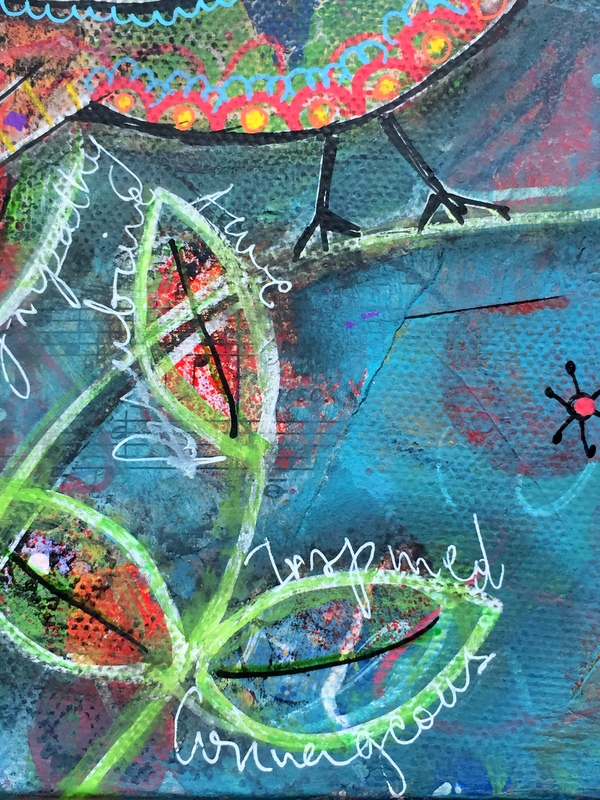 Art is happening again…..will post pictures soon. 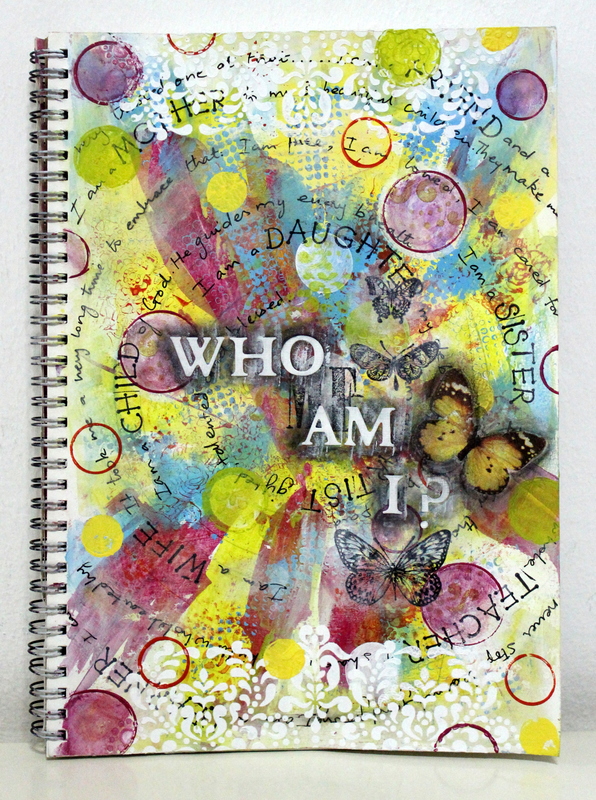 This journal page was ready way in advance as this months DT theme at Mixed Media Lab is so relevant to me and my family. We have in fact just made such a journey half way across the world…from Africa to Asia! I have to admit another reason why it was so exciting to make this page was all the materials and tools in my stash that were so well suited to such a theme! My page started out as always with a coat of gesso. 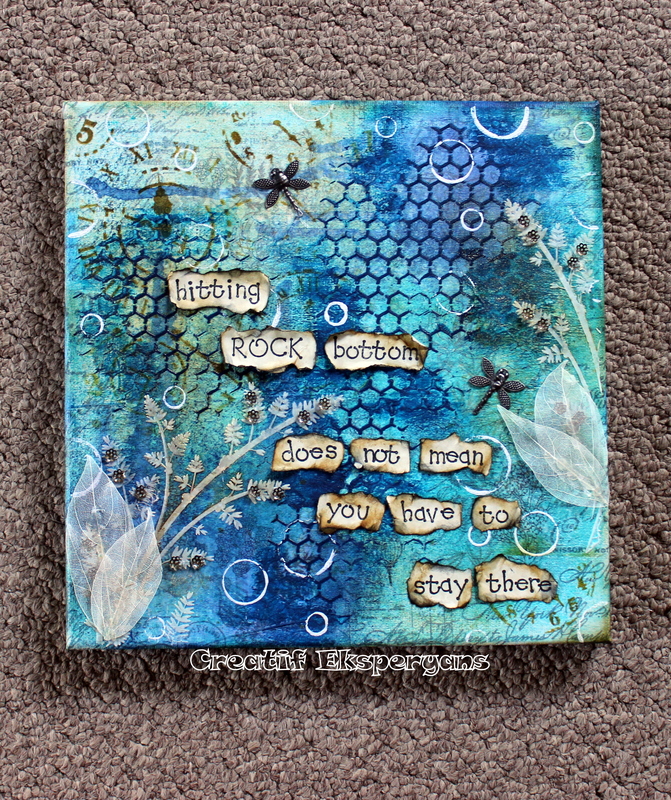 This was followed by some distress ink background in various shades of blue and brown. I used the world map stamps in a diagonal arrangement and followed that up with passing white acrylic paint through the ray stencil. This little pile of suitcases was on the front cover of a craft magazine in SA and the moment i saw it I knew it would come handy. so I cut it out and saved it in my stash. And I was right…:)) It fitted so well in this page. But before sticking it down I placed it on the page and distressed the area around its edge. Looking at it now I am wondering why I did that but there probably was a good reason for it at the time. Next I used a wording stencil that has some amazing journey and travel related text. Along with that I started to place some of the stamps too. I had so many to choose from I could not decide how many was too many. At this stage I stuck down the suitcases and carried on with the layering. Next up was texture paste through a TCW stencil which also has some stamps and postal themed designs. And so the layout was coming to life…. I found this lovely Africa stamp just begging me to use it…:)) how could I refuse???? And some more beautiful postage stamps and map related images. Next came the message and ta da……the page was done….well almost! 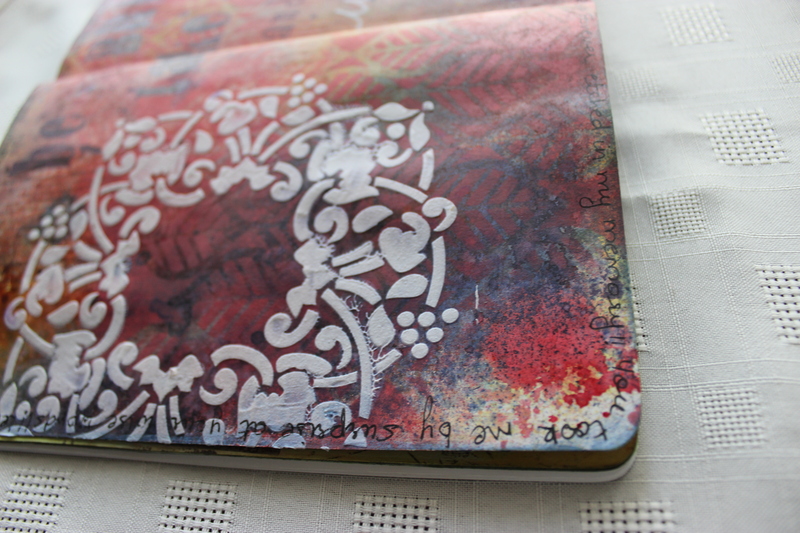 Eventually I added some journalling to the edges of the page. Some ‘notes to self’ almost about the move and keeping myself motivated. WordPress reminded me today was the first anniversary of this blog! Thank you for following me thus far. Your presence has been inspiring and fun. I hope you stay a while and accompany me onward….this journey is only just beginning! 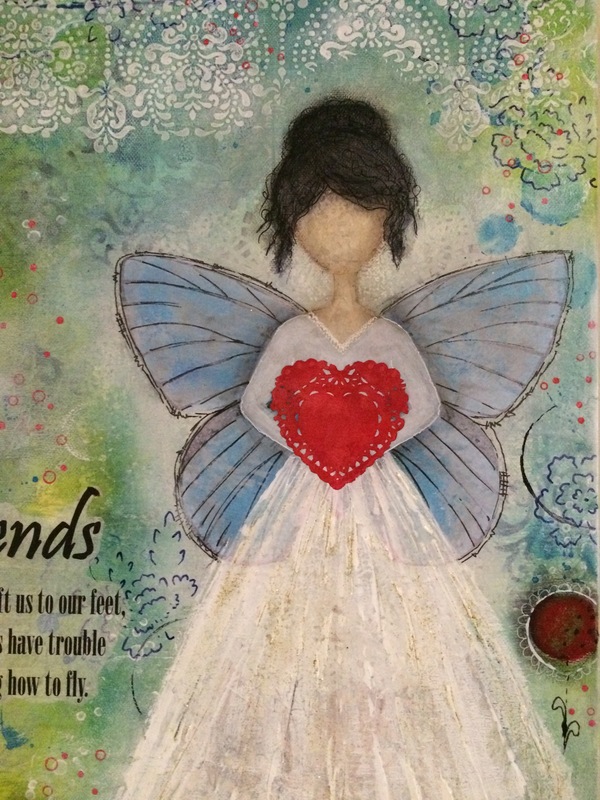 This months DT theme had me really worried……firstly beacuse I am not a big fairy and elf person…Angels….ahhh those I can do all the time. Secondly I have been very uninspired to create these past weeks….I’m either too tired or its the wrong time or I am procrastinating….I have been very unproductive in the studio. It could also be that my creative self is busy ”creating’ our new home. Deciding where to hang paintings, styling all our little mementos and photographs and constantly re-organizing cupboards….its just hasnt left me with much head space to work on art in the studio. Back to this months project, It took me awhile to decide how to incorporate all 3 into a single project. 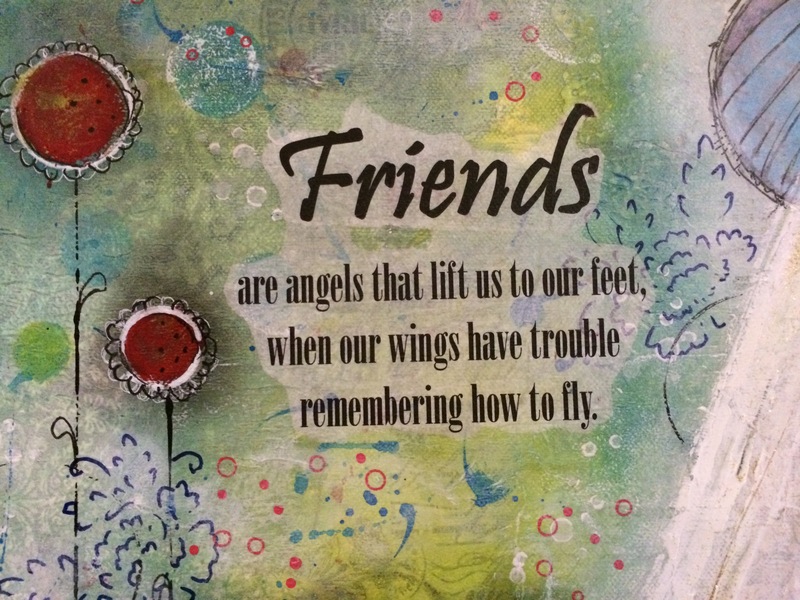 Once there I felt I was overthinking it and decided to pursue just Angels…. This project was made for my BFF in Cape town. She truly is my Angel….my friend in deed, my partner in crime, my shoulder to lean on……social media and technology is great but it cant replace those face to face meetings and coffee mornings…I miss her so. But while the miles separated us I wanted her to have something to hold on to. Something to remind her that I am with her in spirit, no matter how far apart we are. This is a fairly large canvas going by my normal project sizes. 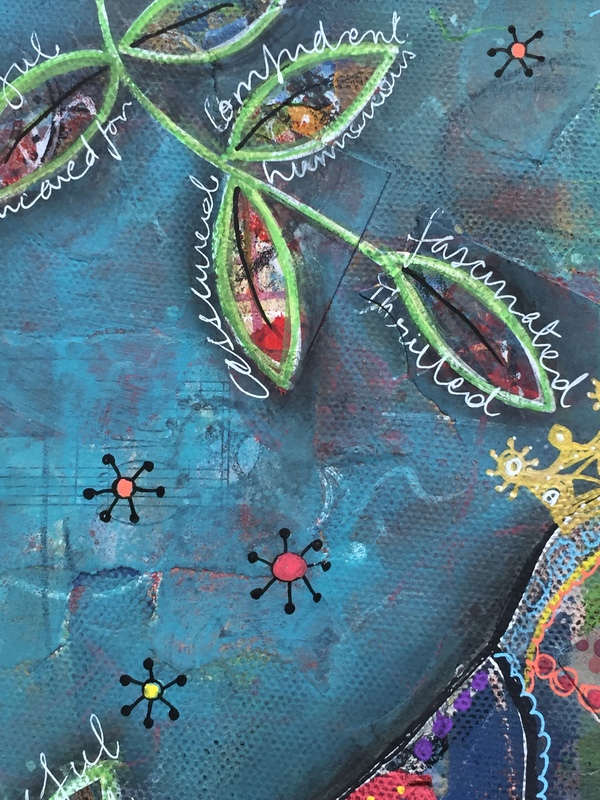 I have used my usual collage papers, texture paste, stamping and stenciling techniques. I love the skirt on the Angels dress. It has a beautiful texture and flecks of gold. My favorite element of this piece is the heart and these little lollipop flowers. they were so fun to make. With every layer they evolved and changed. I have some words on their stems to describe our relationship. I was so proud of how it turned out! And my BFF was super chuffed to have one of my originals. She reckons it will be worth a lot of money someday…lol….A girl can dream right. Dont forget to go over to Mixed Media lab page and check out what my fellow DT members have come up with for this theme. Wow! Another entire month gone by since my last post! Its been a very busy month for sure. We moved to our new place and its been unpacking unpacking unpacking since. A bit of a difficult task when you have a LOT of stuff and are trying to condense it into a much smaller space. This months theme for my DT contribution to Mixed Media Lab is ‘Emotions’. A theme that is definitely relevant to the state(s) of mind I have been in these past weeks. Its almost 2 months since we moved from Cape Town and each day has brought its own challenges. Amid those daily domestic woes I miss my friends and familiar faces dearly, miss having a car to go where I want when I want, miss the familiarity of supermarkets and shops and above all I yearn for the beauty of Durbanville and the immense joy I got from viewing the beautiful mountains and valleys each day. And despite all those sad feelings my heart is simultaneously thankful, grateful and happy, for all the Lord has blessed us with. Much more than we could have imagined. We have a lovely house, the kids are well settled already in their wonderful new school, I have started to make new friends and engage with the community at school and in our neighbourhood. There is excitement for the new projects I am undertaking and planning, Life has come together a lot faster than could be considered ‘normal’ for newcomers. So my canvas today reflects all these emotions. The quote is beautiful and I will remind myself of this whenever my emotions start to get the better of me. A little about the process: Since the studio is still not quite set up I am struggling with step by step pictures and videos, (other than the fact that I do get carried away and forget to take pictures most often…:)) but I will try to explain as best I can. The canvas started with me applying random colors of acrylic paint with a credit card. Then I added some scraps of paper and music sheets for texture. went over these again to highlight certain colors. Then doodled all over with a black pen and stenciled some white paint patterns. Some paint splatters in the same colors used at the base followed.Also added some motifs with Stazon ink and stamps. I added some metallic gold paint sparingly for some luminosity. Next I drew the leaves and bird with a water color pencil. Painted the teal back ground in (choosing a contrasting color to the base colors used) leaving the insides of the leaves and bird untouched so it would show the background. The paint was fairly thin so that the background effects were still somewhat visible. With my white posca pen I then outlined the design again. This looked a bit too stark and bright so I went over it with a green Inktense pencil. I shadowed all the design areas with a charcoal pencil and set about using other Posca colors to make patterns on the birds. I love the folksy look this achieved. The black outlines on the bird and leaf veins were done with a micron pen and the same used for the writing and little doodles. The gold crown picked up the gold flecks in the background nicely. It was drawn with a Uniball signo gold pen. 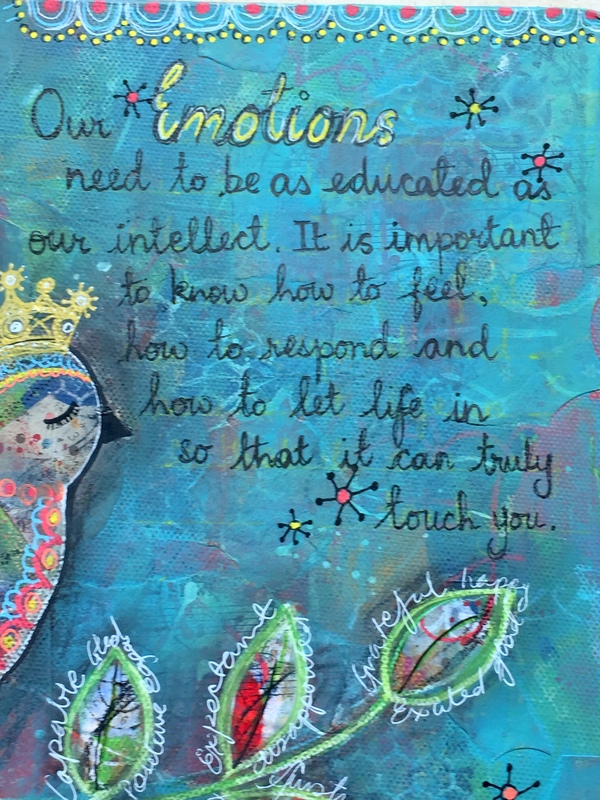 Lastly I added the ’emotions’ around all the leaves with a white gel pen and wrote the quote. This piece will sit in my studio for sure. It is one of my most favorite projects to date. I hope your enjoyed viewing it and dont forget to go over to Mixed Media lab to check out the other posts on the same theme. Cheers to February! What better way to start a new journey than reintroducing /reminding yourself about WHO you really are! 2014 was an important year for me in that discovery of who I am, what I want out of life, where do I see myself in the larger scheme of things…….yep plenty of mid life crisis thoughts….lol! But crisis can be avoided with clarity of thought and planning and so I dedicated 2015 towards the journey called ME. There were plenty of great moments with an equal amount of really scary ones, but with my faith strong I sailed through and am now on the anvil of another new beginning…literally and figuratively. If you have been following my facebook page you might know that we have just moved to Singapore 3 weeks ago…..which also means that my art supplies are at this time floating across the ocean from South Africa. Knowing that I would want to indulge myself in some art while on this odd kind of vacation from normal life, I did make myself a little travel pack. Its is just the bare minimum so bear with me on this one. So down to business. I had a few different ideas for this theme. But some of them had to be shelved for lack of tools and supplies. I might just make them later because there are 2 I really want to try out. For this page I am working in my Lana journal. This is an A4 layout which I really like because I don’t have a seam/spine to deal with. After the first few pictures I was completely engrossed in what I was doing and could not get pictures with my messy hands. I hope the description helps you follow the process. I started by covering the page with gesso. Then marked out concentric circles loosely with a pastel pencil. Chose a few colors and spread them in a random ray pattern starting from the middle with a small palette knife. Then using the same colors through a stencil I created a bit of texture in the background. Instead of using gesso to subdue the colors I used white acrylic paint. Its was applied heavier around the edges and lighter in the center. Using the circle stencil and various bottle caps I made some white circles patterns. I stamped the key words that define me with alphabet stamps and Stazon ink going around in concentric circles. Scribbled the finer text with a micron pen loosely following the circles I had marked earlier. Each scribble is related tot he key word stamped in larger font. Do you see the ME in the center? 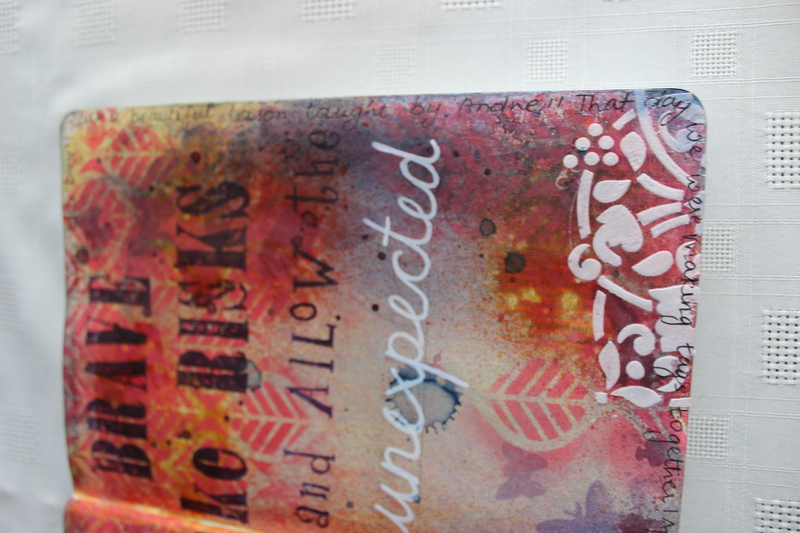 Using a light modelling paste, I stencilled a border at the top and bottom. All those bottle caps and bits I mentioned earlier? this is where they came handy to mark little bright colored outlines and circles. I also filled in some of the previous white circles with color. Once I had placed the main message I decided it needed some more motifs. Butterflies are my most favorite motif of all so I chose some stamps and a napkin print to go on. 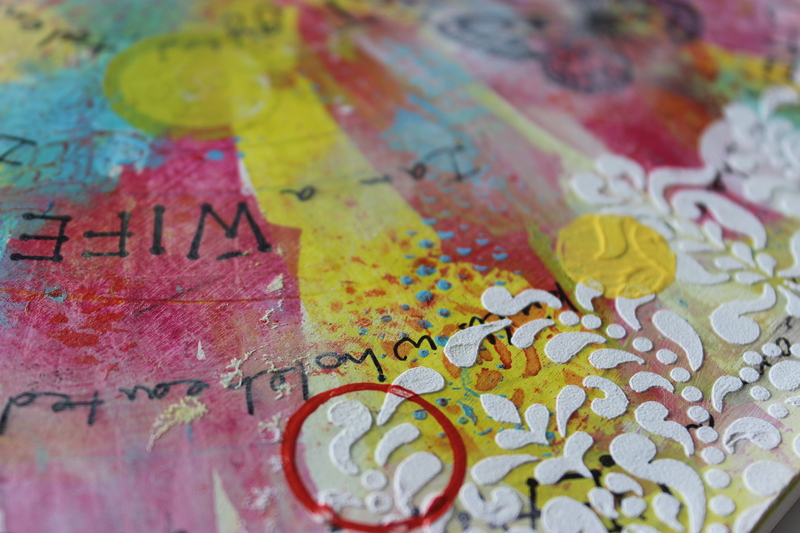 The letters were attached with gel medium and then covered with clear gesso. I tried to highlight the letters by using a charcoal pencil around the letters. Unfortunately this also resulted in the white letters becoming muddy…;( Next time I have to remember not to gesso the top of the letters. That way I can wipe off the charcoal with a wet tissue as the gel medium creates a resist/protective film. Limited resources do not always mean limited fun….I thoroughly enjoyed making this page and love how well it turned out. Who are you?………do post a link to your page if you follow the prompt. how mixed media found me. Its been almost 3 years now that I have indulged in mixed media art. 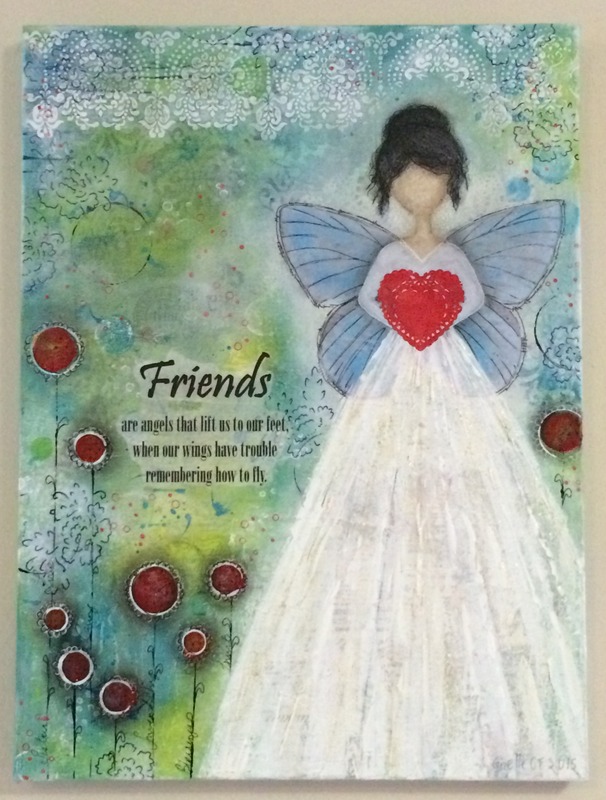 I have worked a few different canvasses, paper projects, altered bottles and more recently in art journaling. 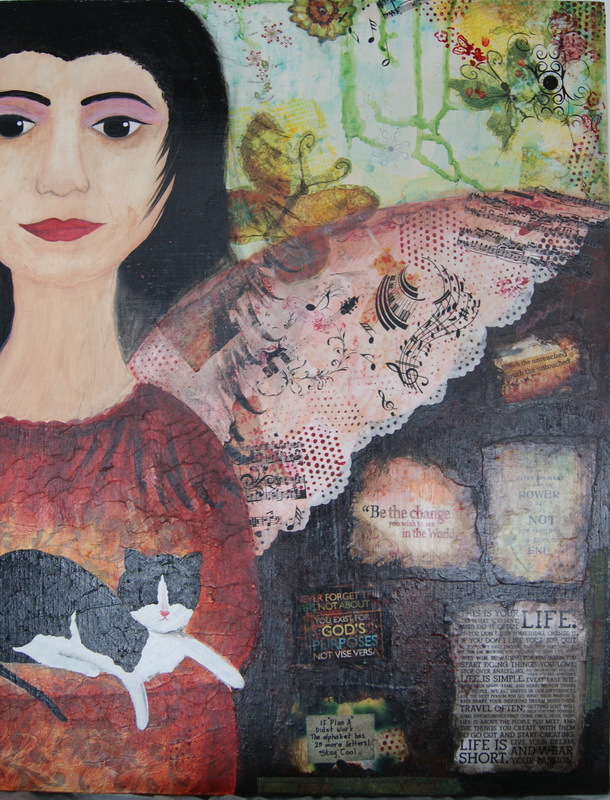 But there is a really special story to how mixed media found me. It all started with me wanting to make a hand made gift for my daughters 18th Birthday. I was looking for ideas on how to make this thought a reality so decided a visit to my local art store would help inspire me. And it did! On the top shelf there sat this canvas that I had been ogling for a while. That afternoon I asked to see it more closely and I was intrigued by the intricate little details that were not evident from afar. My friend Melinda owns that art store and it just so happened that it was one of her art works. She told me about the painting and how she came to experiment with that mixed media art and lent me the book she had worked from. 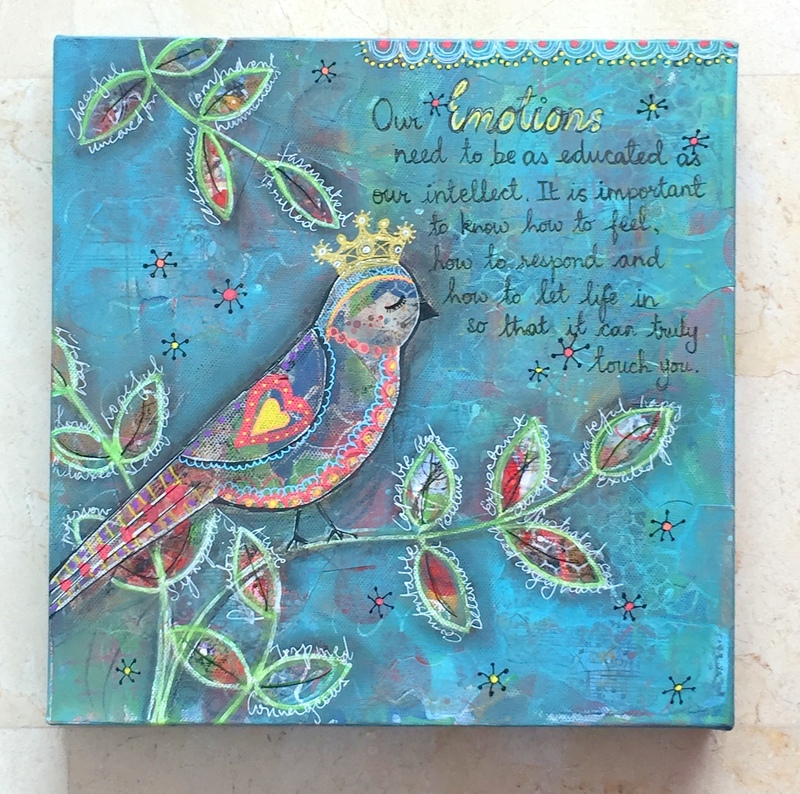 It was my first introduction to Kelly Rae Roberts and the world of mixed media and ‘she’ art. Lots of google hours later I had a plan….well sort of! I spent 2 working days on that project. It was a first for me on so many different elements! from tools to mediums to techniques. Plenty of help was at hand because I worked at the shop itself. Firstly because I had to be away from home so it would be a surprise for my daughter and secondly for convenience, because everything I needed was sold at the shop. To say I winged it is putting it mildly!….and of course being someone that really takes a challenge head on, I painted a face on my first canvas in over 20 years! This was where it all began. 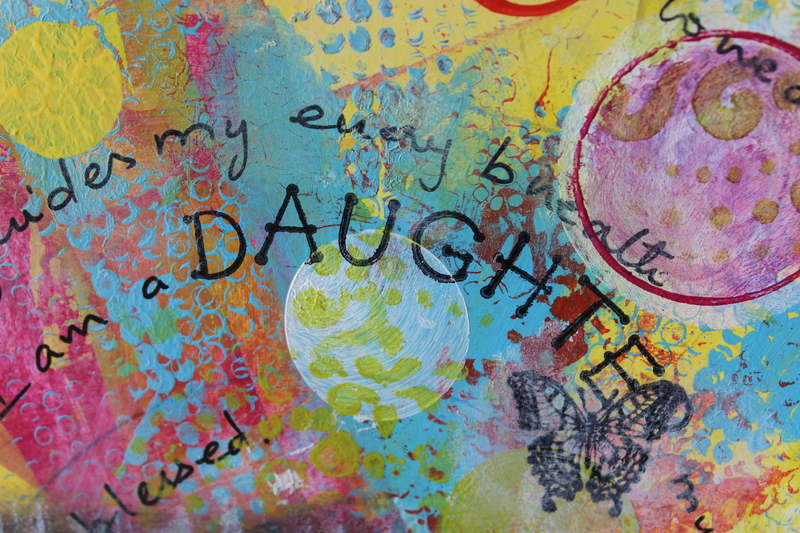 There is decoupage, collage, painting, rubs ons and plenty more in this project. The girl represents my daughter. The angel is one of her most favored symbols as it forms part of her name. The wings are part angelic part representative of the freedom that comes with age. That breaking out of a cocoon as it were is also why there are butterflies (and because they are my favorite). It carries her love for music, her pet cat and some words of wisdom that will always hold her in good stead. In a few months she will turn 21!!! I have already been asked for another art work to commemorate that big day…..and some pre-orders on other birthdays to come…lol. 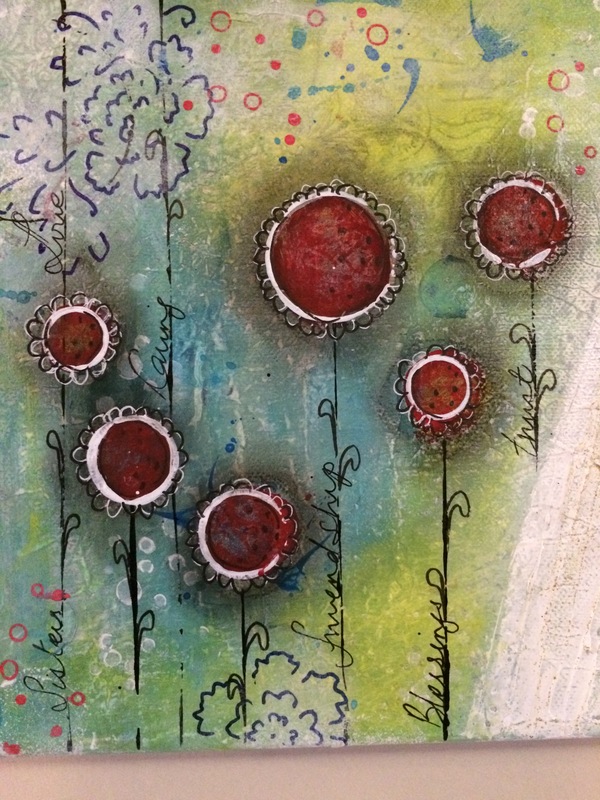 And so Mixed media sort of found me…..this was the start…..it pushed me out of a shell. I found myself exploring so many kinds of art forms, I took classes, I made art, plenty of it, I indulged myself completely…..heck I even taught classes this past year! 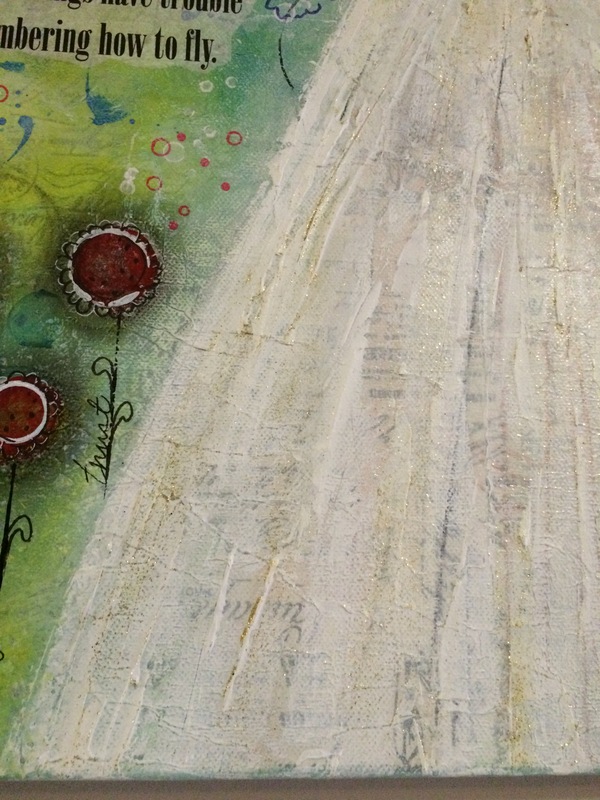 A journey begins with the first step…..and this was my first step in my art journey and the world of mixed media. Time to let the cat out of the bag!!! I answered my first DT call a few months ago………and was pleasantly surprised to be accepted!!!! Whoop whopp ! I am so thrilled to join a group of Italian ladies as part of their DT for 2016. DT= Design team for the uninitiated. The DT 2016 introductions began last month and my introduction is now on the Scrappin Sisters blog. I am so excited about this new phase in my art journey and look forward to contributing some inspiring art. From 1st Jan 2016 the Scrappin Sisters blog will convert to a new name ‘Mixed media lab’ go like the facebook page so you are with us from the word go! My project theme was ”rocks”. Details are on the blog. Another first for me is a video I made for this project so check out their blog to access a link. Go over and give them some love. oh and comment on the video because I would love to hear what I can do better! This page is very very special to me. My older son is a boy after my own heart. He has all the creative genes he could possibly have inherited from me and his maternal grandparents…..:))) Not only is he inherently creative himself but always curious about things I do and wanting to experiment and work alongside me while I craft. 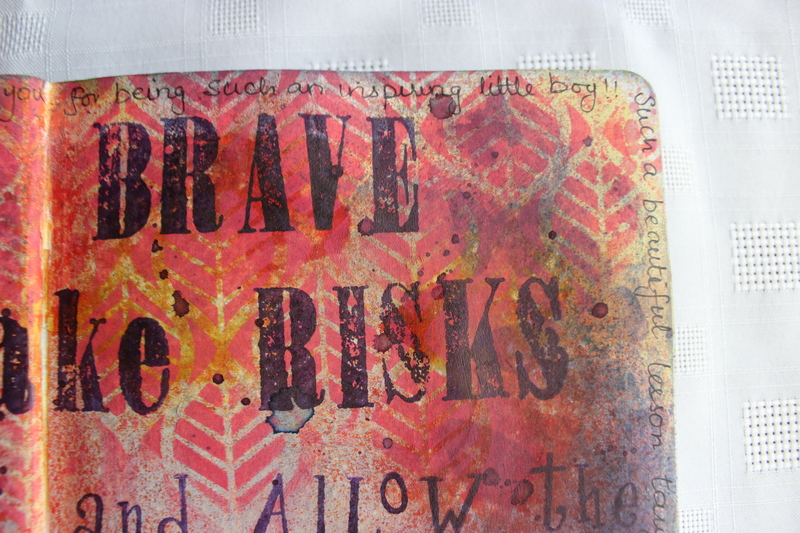 Before I ran the Art Journaling introduction work shop last month I wanted to run a test on some tags. To ensure the time would be enough, what sort of tools and equipment I need to carry, what sort of designs would be feasible, etc. My son was very intrigued by the samples I had made and decided he wanted to try it too. We were working side by side and going through a tutorial online each using their own colors and motifs but the same techniques. At some stage I decided to add a spray of colour and it went a bit south!…;( I was disappointed that my over zealousness to add colour had now ruined the piece. My son seeing my unhappy face said ” you took a risk, It did not work out, so what! You tried something new” This really touched my heart and for days I got that warm fuzzy feeling every time I thought about it. At 10 years old he taught me a very valuable lesson and gave me a wonderful memory to live with. I created this page to honour that memory. Ironically the experiment had a few bumps and the page lived up to the message it carried. Writing this post made me realize I don’t have a picture of the tags mentioned above. I must remember to add it here soon.